[ Minute Book; ships ] The Shipping World Limited | Minute Book. Unpaginated, folio, red calf, worn edges and spine, virtually every page either written on or with typescript pasted on, with other relevant enclosures. Minutes recorded from the first meeting in 1883 to 1946. Presumably this was the Company responsible for publishing the "Shipping World and Herald of Commerce" (Gresham Press, 1883ff - the Company operated out of "The Gresham Press Building according to a piece of printed ephemera enclosed - including relevant circulars and financial statements). [ Henry Pelham-Clinton, 5th Duke of Newcastle. ] Autograph Signature ('Newcastle') on part of letter to Sir John Hindmarsh, Lieutenant-Governor of Heligoland. [Newcastle; Pamphlet ] A copy of the ward list of burgesses of the Borough of the Town and County of Newcastle upon Tyne. From the 1st. day of November, 1835, to the 1st day of November, 1836, inclusive, etc. Newcastle-upon-Tyne: Printed by W. Boag, Nos. 2 & 3, foot of Dean Street, 1835. Pamphlet, pp., not paginated, count includes title (first page present), disbound, grubby, minor ink stains on title (and inked ticks for some of the entries), other staining, first three leaves detached, ow fair. One copy only recorded on COPAC/WorldCat, at BL. 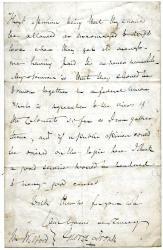 [Duke of Newcastle; horse-racing] Autograph Letter Signed "Newcastle" to "Frank" about a race-meeting. Three pages, 8vo, bifolium, small stain, otherwise good condition. He comments initially on a cutting (from a newspaper?). Singular to relate there is more truth in that cutting than you wd imagine. Before leaving London I had persuaded Miss Kellogg to come to Brighton for the race week: I got a letter from her to say [...]. [Printed item, inscribed by the author John Holland.] Tyne Banks. A Poetical Sketch. By a Visitor in Newcastle. Newcastle: Printed for the Author, for private presentation only, by J. Blackwell and Co., Courant Office [ Newcastle ]. 1832. 40pp., 12mo. Stitched and disbound. Internally in fair condition, on aged paper, with outer leaves stained. The margins have been slightly trimmed, affecting the author's presentation at the head of the title page, which reads: 'Mr Walker | With J. Holland's Respe | Octr. 26 <...>'. Full page 'Preface' in small print, dated 'Newcastle, September, 1832', on p.3, and full-page 'Note', in even smaller print, on the following page. A nicely printed poem, with numerous elucidatory footnotes in small print. [Printed exhibition catalogue.] 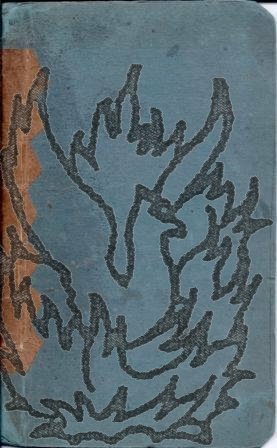 William Butler Yeats 1865-1939 | Catalogue of an Exhibition 13th-22nd May 1965 | Opened by T. R. Henn, C.B.E., D.Litt. Fellow of St. Catharine's College, Cambridge. pp., 4to. Duplicated typed pamphlet, printed on the rectos of eighteen leaves, stapled into green card covers. Full-page introduction followed by catalogue with 59 entries, with commentary. Scarce: no copy traced on either COPAC or OCLC WorldCat. [William Wight of Ednam, Scottish poet.] Autograph Letter Signed ('W. Wight') to his 'dear new Friend' 'Mr. 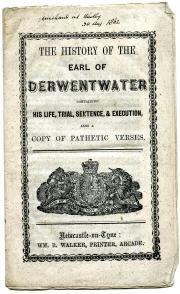 Falconer' of Newcastle, containing his poem 'My Absent Friend'. 3pp., 12mo. Originally a bifolium, but with the two leaves now separated. 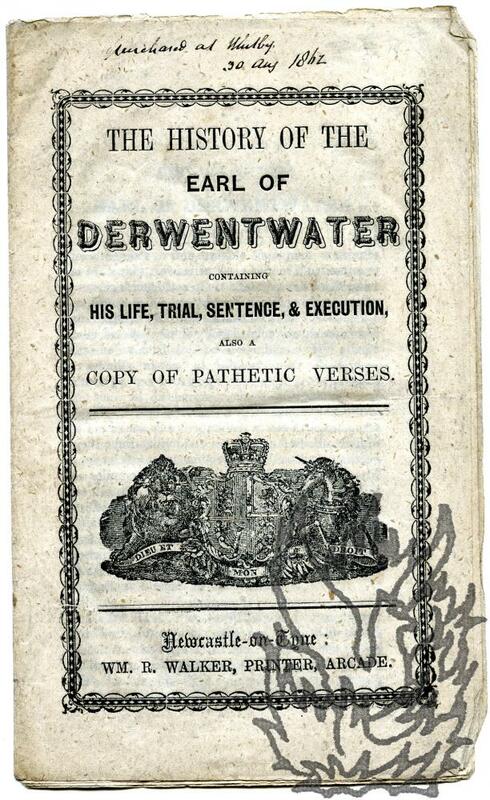 In fair condition, on aged and worn paper watermarked 'S S | 1817'. The reverse of the second leaf is addressed to 'Mr. Falconer, | Newcastle on Tyne.' He begins by thanking Falconer for the 'nice little collection of Poems [...] The "Wreath" will often amuse my solitary hours'. After some pieties he states: 'I gladly subjoin a few verses for your amusement, and that of Miss Falconer [...] How glad I should be to see you and her again at Ednam! [Dr Robert Steavenson of Newcastle upon Tyne.] Manuscript copy of his bill to the trustees of Lieutenant James Boyd, itemising disbursements (mainly clothing). With signed note by David Williamson [later Lord Balgray] and signatures of two trustees. Dated from Northumber[land] Street [Newcastle upon Tyne]. 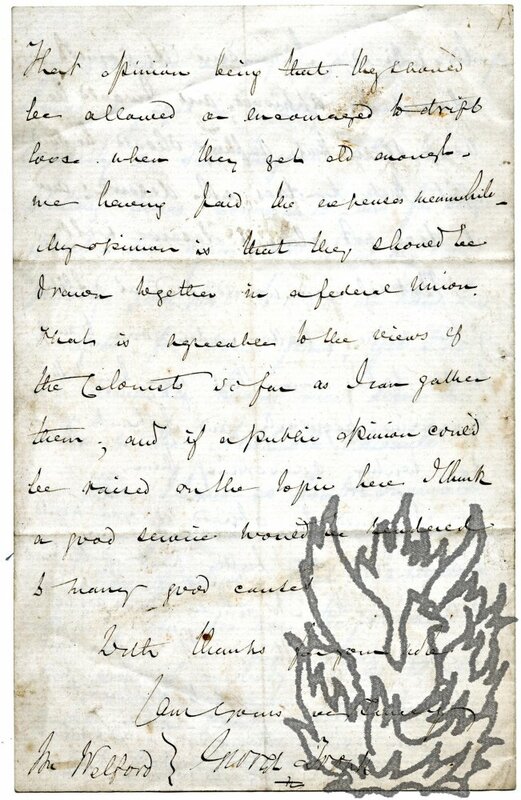 With short signed note by David Williamson [later Lord Balgray], dated Edinburgh [Scotland], 4 August 1813. Autograph Note, in the third person, from [Algernon George Percy, 6th] Duke of Northumberland, agreeing to 'take a copy of the History of Newcastle, as requested by Mr Robinson'. On letterhead of Albury Park, Guildford. 20 April 1885. 1p., 16mo. Letterhead printed in green on green paper. 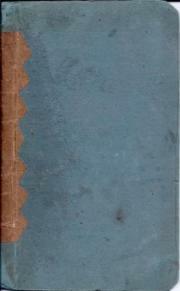 In fair condition, on aged and dusty paper, with traces of pervious mount along one margin. The note reads: 'The Duke of Northumberland will take a copy of the History of Newcastle, as requested by Mr Robinson in his letter of the 17th., to be sent to Alnwick Castle - | April 20. 85.' The reference is presumably to Richard Welford's 'History of Newcastle and Gateshead', published in London by Walter Scott between 1884 and 1887. 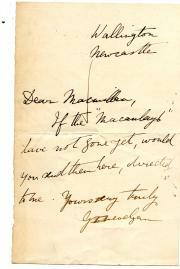 Two Autograph Letters Signed ('Tommy', 'T G R' and 'T') from Thomas German Reed, proprietor, the Gallery of Illustration, Regent Street, London, to Edward Dean Davies, lessee, Theatre Royal, Newcastle, written in affectionate and high-spirited terms. Letter One: 4pp., 12mo. Bifolium. With decorative letterhead in red. Very good, on lightly-aged paper. Addressed to 'My dear Old DD' and 'E. D. Davis'. He realises that Davis is in 'a precious state of mind', and will only send 'a few lines to exchange domestic greetings of kindliness & good fellowship from the circle of Balham to the Square in N'Castle - the waters of the Thames mingle with those of the Tyne'. 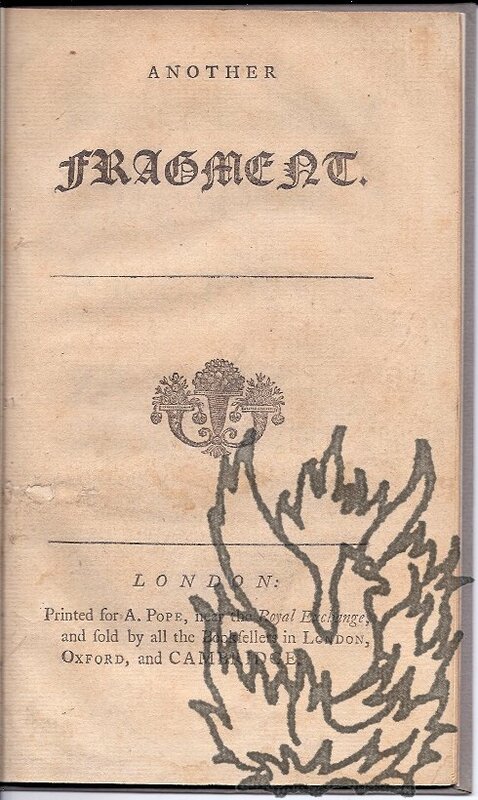 [Printed chapbook.] The History of Stoney Bowes, otherwise Andrew Robinson Bowes: being a Minute Memoir of his Infamous and Notorious Character. 24pp., 16mo. Woodcut vignette on title-page, showing man in military uniform restraining a struggling woman, under a tree. Stitched, in plain cream wraps. Internally fair, on aged paper, in worn wraps. Ownership inscription on flyleaf of 'John Hutchinson | October 1850'. Thirteen line note by Hutchinson on rear flyleaf, concerning the Bowes family, and further manuscript notes by him on pp. 13, 17, 21 and 22. Slip of paper with another note by Hutchinson loosely inserted. Manuscript letter from 'the undersigned ladies and gentlemen of the "Delia" company', at the Tyne Theatre, Newcastle upon Tyne, to Frank Rothsay, signed by sixteen individuals on presenting him with a token of appreciation of his management. Tyne Theatre, Newcastle upon Tyne. 5 October 1889. 1p., foolscap 8vo. Stained, worn and creased, but a unique memento of a Newcastle institution and Grade I listed building, founded in 1867 as the Tyne Theatre and Opera House, and now bearing the euphonious name of the Mill Volvo Tyne Theatre. 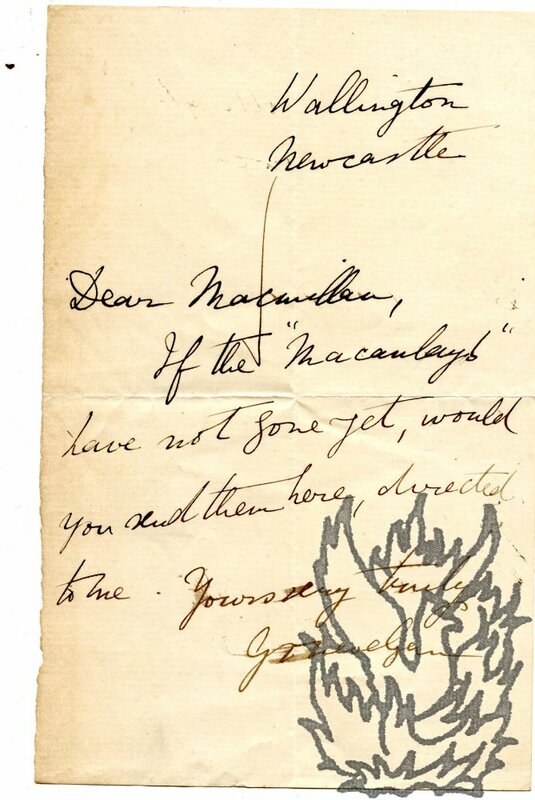 Autograph Letter Signed ('A H Calvert') from the actress Adelaide Helen Calvert to an unnamed theatre proprietor [E. D. Davies, Lessee, Theatre-Royal, Newcastle? ], discussing a forthcoming bill. 12mo, 3 pp. 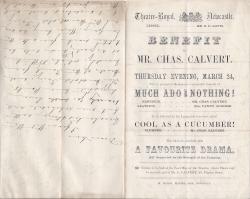 On bifolium, with the printed playbill for the 'Benefit of Mr. Chas. 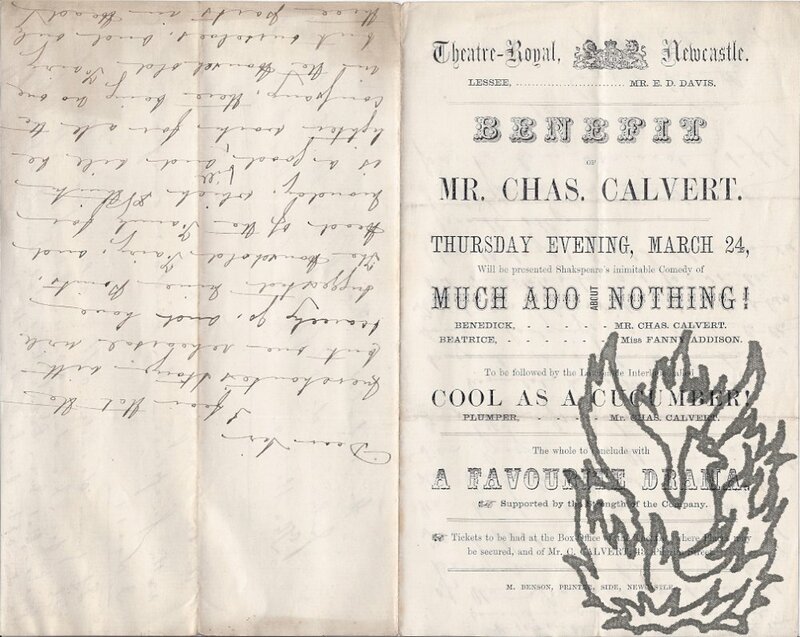 Calvert' at the Theatre-Royal, Newcastle, on the recto of the first page (including a performance of Much Ado About Nothing, with Calvert as Benedick and Miss Fanny Alexander as Beatrice. The letter is 42 lines long. She feels that, 'with but one rehearsal', the 'Merchante's Storye will scarcely go', and suggests performing 'Nine Points, The Household Fairy, and Head of the Family' instead, considering it 'a good bill' and 'lighter works for all the company'. [1750 or 1751] London: Printed for A. Pope, near the Royal Exchange, and sold by all the Booksellers in London, Oxford, and Cambridge. 8vo, iv + 26 pp. In modern grey boards. Text clear and complete. On aged paper, with small holes to first two leaves (not affecting text). The imprint is fictitious. 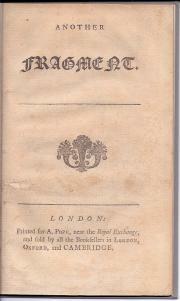 A sequel to 'A Fragment' (London, 1750), a satire on the election of the Duke of Newcastle to the Chancellorship of the University of Cambridge in July 1749. Described in the 'Editor's Preface' as a 'learned, elaborate, curious and antient Fragment, [...] communicated to me by a celebrated Gomerian, Professor of the University of Combrigue'. Attributed to the elder Stebbing by Halkett and Laing, and to the younger in ESTC. Two signed receipts to the Honourable Coast Committee of Northumberland: the first for printing and paper from John Catnach ('Jno. Catnach') of Alnwick, and the second on John's behalf by his wife Mary ('Mary Catnach'), for stationery. John Catnach's bill/receipt, 12 April/29 June 1795. Mary Catnach's bill and receipt, 10 March 1795. Both items in good condition on lightly-aged paper. Both 1 p, on 12mo landscape slips. John Catnach's bill and receipt: 'The Honb. Coast Comit. | April 12 1795. | To J. Catnach | Printing 200 Signal for the Coast 7s .. 0 | 5 qrs. Best Wove foolscap for Do. 1s..2d Per qr 5 .. 10 | £0 .. 12 .. 10 | Recd the above from Thos. Adams Esqr. | [signed] Jno. Catnach | June 29th. 1796.' Docketed on reverse with calculation. Mary Catnach's bill and receipt: 'The Honble Coast Committee | 1795 To J Catnach Dr. | March 10th. 3 Quarto Copy Books at 1/6 - 0 . 4 . 6 | Same time recd. Paymt of Jas. Autograph Letter Signed to [Richard] Welford [of the Newcastle Chronicle]. 2 November 1859; Tait's Magazine Office, 34 Paternoster Row, London, E.C. 12mo, 4 pp. Bifolium. 58 lines of text. Clear and complete. On aged paper, with the outer pages grubby and stained. The delay in replying to Welford's letter is due to the fact that it 'fell aside in Edinburgh and did not reach my hands until lately'. 'I was engaged in a veryy subordinate capacity on Taits Magazine when the shilling series commenced - and for some years - and again had it as my own property from 1846 to 1850 and have had it again for some years; yet I do not remember having ever seen a notice in the Newcastle Chronicle'.